It looks like when herpes virus comes the overall situation might be compared with a disaster since it penetrates into the skin cells and reproduces itself starting to multiply rapidly by making the skin getting red and more sensitive than usually. Blisters or bumps appear on the affected area with the blisters first opening, then healing with the regeneration of new skin tissue. How does the virus appear? Once you have felt exposed to the virus via direct skin-to-skin contact, despite the fact whether you are a male or female or even a kid, it is by average about from a couple of days and up to two weeks before your first episode of symptoms of herpes will “crop up”. While the first outbreak of herpes is usually perceived as one of the worst troubles you may experience (in accordance to statistics it raise up to 60% of those infected with the virus), people are not to take care about the causes. Hence, even if you do not experience any visible symptoms the virus is still penetrating you and will let you know about it’s activity somewhat later on. In fact, herpes is the medical name for a certain group of similar viruses. The group includes so called Varicella-Zoster virus, which produces a kind of chicken pox or sometimes the virus causes infectious mononucleosis. The version called Cytomegalovirus (CMV) is usually a consequence of infections that in everyday life effect common people like in your neighborhood or people frequently socializing, having defective immune systems. At the same time herpes virus called HSV causes genital and oral infections more frequently even via short term close contact (skin to skin). Thus, the infection by species of HSV are more common in Europe, Middle East and USA. Primary infection, i.e. the virus penetrates your skin or mucous membrane and enters the reproduction stage. Within this period the oral sores and other symptoms such as fever blisters are developing, making a lot of inconvenience. The virus more frequently is supposed not to cause any severe sores and symptoms. One may not know that you have it. This is to be called asymptomatic infection. Herpes simplex is seen as a DNA virus that causes sores in and around your mouth. A couple of herpes subtypes may cause these sores. 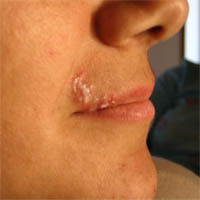 Herpes simplex virus, type 2 or herpes-2, which serves as the reason for the rest of cases. Average incubation period: for oral herpes, the amount of time between contact with the virus and the appearance of symptoms, the incubation period, is 2-12 days. Most people average about 4 days.